Conditions towards the southern part of USA was good on the 20th September around 0300 UTC. I was listening to 1430 when suddenly I hear "WDAL Dalton". I did not know this station but checking around I found out that it realy was a station on 1430 in Dalton GA with this call. An other probleme came up. WDAL was listed with spanish px. I had to contact my friend OJ Sagdahl. 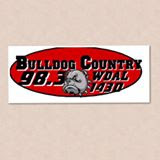 After some mails he came up with the FB page of Bulldog Country 98.3 witch also have WDAL 1430 in the logo. Today I contacted Rick Zeisig, Morning Show host and he responding with a copy of their legal ID who fits with what I heard. Thanks for a new one Rick!